Seventy per cent of all people living in care homes today will have dementia. With the number of people living with this devastating condition expected to rise, it’s no wonder there are fears for how the care sector will cope. 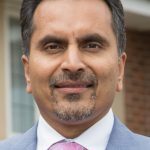 Chairman of Hallmark Care Homes, Avnish Goyal, believes the sector will benefit enormously from research into dementia. Read why he has joined the fightback against dementia. As a company with care in our name, it may surprise some people to hear that we are supporting a research charity. Many of our residents live with dementia, so it is very close to our hearts each and every day. We have seen first-hand the devastating effects dementia can have on an individual and their loved ones, and it’s why we wholly support Alzheimer’s Research UK’s mission to bring about the first life-changing dementia treatment by 2025. Over the years, there hasn’t been the same focus on dementia as there has been on other health conditions like cancer. This is because there has been great support and investment from a number of charities via the public, resulting in huge advances in research which has meant that cancers that were once untreatable, can now often be cured. That’s an incredible feat. We need to elevate support for dementia research to that same level, so we can dramatically improve the lives of people living with dementia and also find a cure. With the number of people living with dementia expected to increase year-on-year, we must recognise that it is our greatest medical challenge and will continue to be in years to come, unless we find a cure. That’s why we must bring the work happening now to develop life-changing dementia treatments to the forefront. We recognise that bringing about such dementia treatments could change the way our care homes operate, but we welcome that change wholeheartedly. We are hoping to do our part to raise awareness of Alzheimer’s Research UK’s fantastic work, both within our organisation and the care sector as well as raise a significant amount of money and have fun in the process. We’re already busy planning fundraising activities for this year, including sporting events, raffles, bake sales, non-uniform days, and a black tie fundraiser event that will take place in London on 29th September for all the care sector to take part in. For further details email us at makingadifference@hallmarkcarehomes.co.uk. Avnish Goyal is the Chairman of Hallmark Care Homes.